Tonight we were supposed to grocery shop after work, unfortunately we were extremely unmotivated and took a little nap instead :) Does anyone else love after work naps? Nothing crazy but just a 20 minute power nap to unwind from the day. I am a huge fan of short naps, they are just so refreshing! 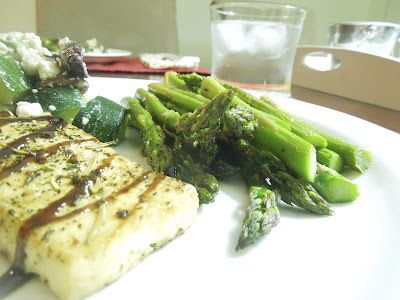 Luckily I was able to scrape up together the last of our fresh ingredients, half a block of tofu, a small cucumber and a huge bunch of asparagus. 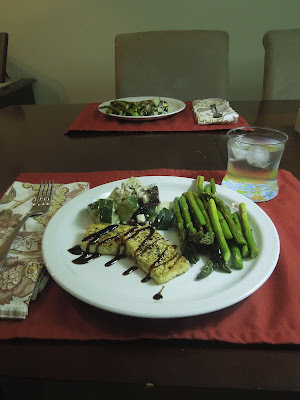 I roasted the asparagus and tofu separately but on the same pan. 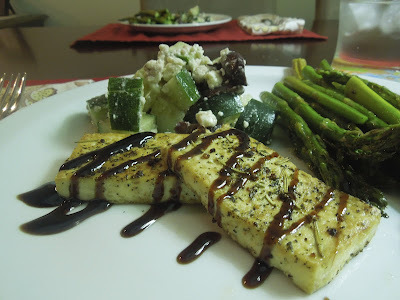 All drizzled in olive oil and s&p, the tofu also has thyme, sage and a little tomato basil seasoning. All roasted for about 15 minutes on 375*. 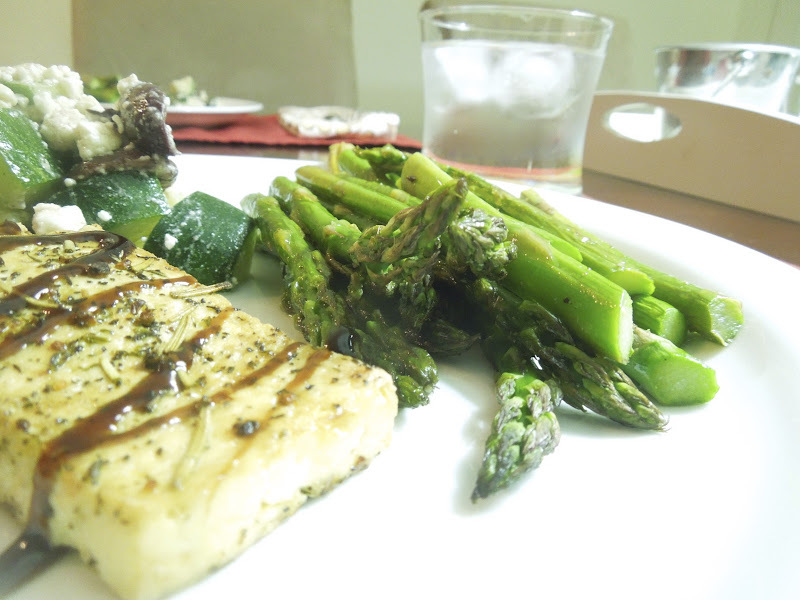 I pulled out the asparagus and put the tofu back in on broil for a few minutes. I threw together a cuke salad with kalamata olives, feta, pesto infused grape seed oil and red wine vinegar. I drizzled the tofu in a balsamic reduction I've been wanting to use and dinner is ready! I'm sure your all well aware of my love for oatmeal and lately I've been wanting to make the switch from oatmeal packets to stovetop but find the the instant so much more convenient. For me the key to eating breakfast lunch and dinner from home everyday is convenience (I always prepare the next days lunch the night before on day I work) if it's too much of a pain I won't make it. Tonight I made three servings of stovetop oatmeal to pack up for the week and of course I forgot about it until I smelled it burning. The part that wasn't burnt on to the bottom was salvageable but reminded me why I use the instant variety... I won't give up though!